Protect the Emerald City from outsiders with this Emerald City Guard black mustache. 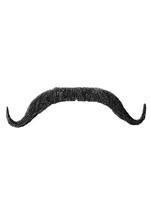 This black synthetic hair mustache has a mesh net attached to the back for easy spirit gum application (spirit gum sold separately). The mustache measures approximately 5" across. This is a fun and reusable costume accessory. A great addition to our Emerald City Guard costume.